Chp.8, "A New Chapter, Images of native America in the writings of Franklin, Jefferson, and Paine"
Chp.11, "The Persistence of an Idea, Impressions of Iroquois liberty after the eighteenth century"
the Haudenosaunee Home Page, comprised of the traditional leadership of the Seneca, Cayuga, Onondaga, Oneida, Mohawk and Tuscarora Nations. This site contains a conference report on the Mohawk Language Standardisation Project undertaken in 1993. The report is presented in Kanien'kehá and English. It contains extensive orthographic information on the new writing standard and also contains valuable phonemic charts. Also of interest is the inclusion of some archaic vocabulary. 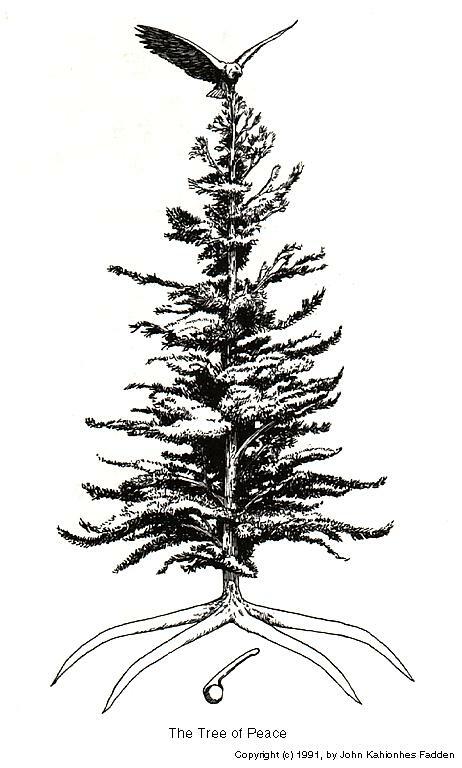 and is often seen in images as being above the Tree of Peace. Scholars and casual readers alike should question the significance, in the age of the Neutron bomb, Watergate, and nuclear energy plant proliferation, of a statement by a North American Indian people. But there is probably some argument to be made for the appropriateness of such a statement at this time. Most of the world's professed traditions are fairly recent in origin. Mohammedanism is perhaps 1500 years old, Christianity claims a 2000-year history, Judaism is perhaps 2000 years older than Christianity. Figure 3. Peacemaker presents his vision. By John Kahionhes Fadden. We believe that American history will not be complete until its indigenous aspects have been recognized and incorporated into the teaching of history. We have assembled here a mosaic of fact and opinion which, taken together, indicates that the objective of the contemporary debate should be to define the role Native American precedents deserve in the broader ambit of American history. . . . Our thesis holds that the character of American democracy evolved importantly (although, of course, not soley), from the examples provided by American Indian confederacies which ringed the land borders of the British colonies. These examples provided a reality, as well as exercise for the imagination -- and it is imagination, above all, that foments revolutions. In this book, we attempt to provide a picture of how these native confederacies operated, and how important architects of American institutions, ideals and other character traits perceived them. We operate as much as we are able from the historical record per se, relaying as much of original accounts as possible. . . .
We attempt to trace both events and ideas: life, liberty, happiness; government by reason and consent rather than coercion, religious toleration (and ultimately religious acceptance) instead of a state church; checks and balances, federalism; relative equality of property, equal rights before the law and the thorny problem of creating a government that can rule equitably across a broad geographic expanse. Native America had a substantial role in shaping all these ideas, as well as the events that turned colonies into a nation of states. In a way that may be difficult to understand from the vantage point of the late twentieth century, Native Americans were present at the conception of the United States. We owe part of our national soul to those who came before us on this soil. As is the case with many histories, this book proceeds along a time line. Except for a few earlier premonitions, our historical study begins around 1600 with "Vox Americana," which summarizes early English and French traders', missionaries' and settlers' accounts of native political organization and attitudes toward liberty. "Perceptions of America's Native Democracies" continues this theme with brief descriptions of how Native American nations that bordered the British colonies ordered their affairs. "Natural Man in an Unnatural Land" examines the image of American Indian peoples in European popular culture in the seventeenth and eighteenth centuries; "Ennobling `Savages'" considers the degree to which the same image was reflected in the works of major French and British philosophers of the time. "Errand in the Wilderness" takes the story back across the Atlantic for a detailed study of Roger Williams's use of native precedents for political freedom and religious toleration. 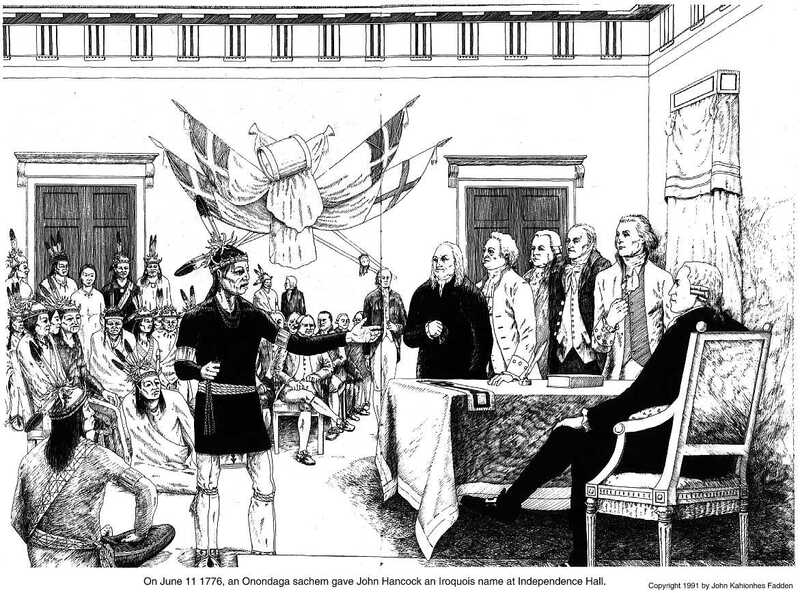 "The White Roots Reach Out" concentrates on the idea of federalism as seen through the eyes of Benjamin Franklin and mid-eighteenth century leaders of the Iroquois such as Canassatego and Hendrick (Tiyanoga), centering on the Albany Congress of 1754. The revolutionary era begins with "Mohawks, Axes, and Taxes," an account of ways in which the image of the Indian was reflected in propaganda and popular art between 1763 and 1776. "A New Chapter" compares the images of native America as utilized by Franklin, Thomas Jefferson and Thomas Paine. The timeline resumes once again in "An American Synthesis," which organizes events (between roughly 1775 and 1786) around the founding of the Sons of Saint Tammany, a patriotic organization succeeding the Sons of Liberty, which combined European and Native American ideas and motifs. "Kindling a New Grand Council Fire" continues the study into the constitutional period. 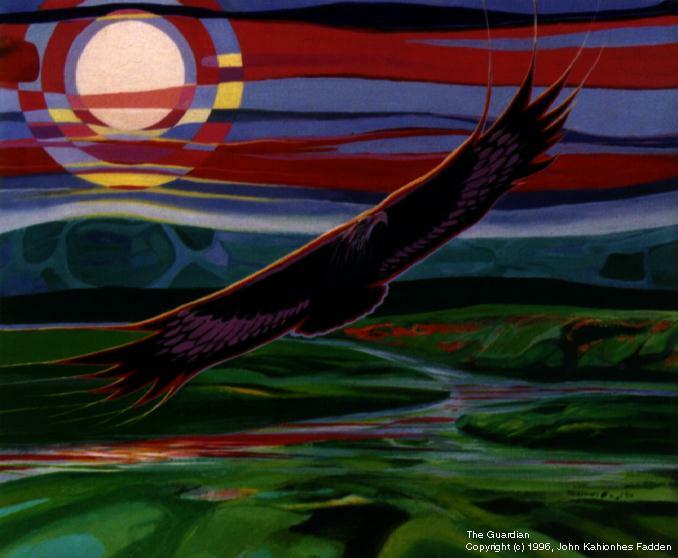 "The Persistence of an Idea" traces references to native ideas in governance (particularly those of the Iroquois) through the nineteenth to the mid-twentieth century and thus concludes our analysis. Figure 10. "Our wise forefathers established Union and Amity between the Five Nations. This has made us formidable; this has given us great Weight and Authority with our neighboring Nations. We are a powerful Confederacy; and by your observing the same methods, our wise forefathers have taken, you will acquire such Strength and power. Therefore, whatever befalls you, never fall out with one another." Canassatego, the great Iroquois chief, advising the assembled colonial governors on Iroquois concepts of unity in Lancaster, Pennsylvania, 1744. Artwork by John Kahionhes Fadden. This book has two major purposes. First, it seeks to weave a few new threads into the tapestry of American revolutionary history, to begin the telling of a larger story that has lain largely forgotten, scattered around dusty archives, for more than two centuries. By arguing that American Indians (principally the Iroquois) played a major role in shaping the ideas of Franklin (and thus, the American Revolution) I do not mean to demean or denigrate European influences. I mean not to subtract from the existing record, but to add an indigenous aspect, to show how America has been a creation of all its peoples. In the telling, this story also seeks to demolish what remains of stereotypical assumptions that American Indians were somehow too simpleminded to engage in effective social and political organization. No one may doubt any longer that there has been more to history, much more, than the simple opposition of "savagery" and "civilization." History's popular writers have served us with many kinds of savages, noble and vicious, "good Indians" and "bad Indians," nearly always as beings too preoccupied with the essentials of the hunt to engage in philosophy and statecraft. This was simply not the case. Franklin and his fellow founders knew differently. They learned from American Indians, by assimilating into their vision of the future, aspects of American Indian wisdom and beauty. Our task is to relearn history as they experienced it, in all its richness and complexity, and thereby to arrive at a more complete understanding of what we were, what we are, and what we may become. The Iroquois' extension of liberty and political participation to women surprised some eighteenth-century Euro-American observers. An unsigned contemporary manuscript in the New York State Library reported that when Iroquois men returned from hunting, they turned everything they had caught over to the women. "Indeed, every possession of the man except his horse & his rifle belong to the woman after marriage; she takes care of their Money and Gives it to her husband as she thinks his necessities require it," the unnamed observer wrote. The writer sought to refute assumptions that Iroquois women were "slaves of their husbands." "The truth is that Women are treated in a much more respectful manner than in England & that they possess a very superior power; this is to be attributed in a very great measure to their system of Education." The women, in addition to their political power and control of allocation from the communal stores, acted as communicators of culture between generations. It was they who educated the young. Another matter that surprised many contemporary observers was the Iroquois' sophisticated use of oratory. Their excellence with the spoken word, among other attributes, often caused Colden and others to compare the Iroquois to the Romans and Greeks. Updated to November 12, 1997 (reflecting the author's continued gathering of citations). Since 1992, I have kept a bibliography of commentary on assertions that the Haudenosaunee (Iroquois) and other Native American confederacies helped shape ideas of democracy in the early United States. By 1995, the bibliography had reached roughly 455 items from more than 120 books, as well as newspaper articles and book reviews numbering in the hundreds, academic journals, films, speeches, documentaries, and other sources. The bibliography was assembled with the help of friends, as well as searches of libraries and book stores, and personal involvement in various skirmishes of the debate. The number of references exploded during 1995 because I began to search several electronic databases. Before I explored these databases, I had been acquainted with the spread of the idea on a more personal level, especially through debates in academia that have been chronicled with Donald A. Grinde, Jr. in Akwe:kon Journal (now Native Americas) and the American Indian Culture & Research Journal (1993.014, 1990.002). Now, I was watching the idea take on an animus of its own, detached from its scholarly moorings. As the debate expanded in popular consciousness, a grand cacophony of diverse voices debated the type of history with which we will enter a new millennium on the Christian calendar. . . . Despite its caricature as a horror story of "political correctness" and the jarring nature of some of the debate over the issue, the idea that Native American confederacies are an important early form of democracy has become established in general discourse. History is made in many ways, by many people; the spread of the idea that Native American confederacies (especially the Haudenosaunee Confederacy) helped shape the intellectual development of democracy m the United States and Europe is an example of how our notions of history have been changing with the infusion of multicultural voices. It is fascinating to watch the change in all its forms -- and the debate over the issue in all its cacophonous variety. This bibliography comprises the "field notes" of my journey. Immigrants from Europe often have borrowed from native peoples, embraced this knowledge as their own, and then forgotten its origins. Meanwhile, the prevailing assumptions of the "winners'" histories condemn Native Americans as primitive and brutish. The reconstruction of history in its true complexity takes some work, since it often runs counter to the heavy weight of well-established assumptions. So it has been in the evolution of democracy, [Richard] Williams [executive director of the American Indian College Fund] believes: "The political structure of the great Iroquois Confederacy served as a model for democracy among the founding fathers, who wrote the Constitution based on `we the people,' something unheard of in the aristocratic, feudal societies of Europe. In fact, there is no word for `I' in any American Indian language, which was a profound concept to the framers who closely studied the tribes' customs, government and culture." located about the six smokeholes. I removed a copy of Robert H. Bork's Slouching Toward Gomorrah: Modern Liberalism and American Decline from our Library's new-books shelf with a sense of impending ironic triumph. Would I be able to add yet another sliming of my life's academic work by a neo-conservative household name who has never heard of me? After consulting Bork's index under "Iroquois Confederacy," on pages 306 and 307, I hit pay dirt. I ceased to be a mild-mannered middle-aged professor of principally Norwegian extraction who has spent 15 years at a Midwestern university teaching undergraduates how to write newspaper stories and essays on Black Elk. Suddenly, I saw myself portrayed by Bork as a primary sloucher toward Gomorrah in his pantheon of politically motivated assassins of western civilization's most cherished canons, an advocate of the demon multiculturalism, and a bona fide barbarian at the Gate. This is heady stuff for a professor from Nebraska. This proclamation brings home inspiration and renewed dedication to our quest for self-determination, justice, freedom and peace in our Homelands and our Territories. Indeed, the quest is a renewal of what we enjoyed before the coming of our White Brothers from across the sea. We lived contentedly under the Gai Eneshah Go' Nah, The Great Law of Peace. We were instructed to create societies based on the principles of Peace, Equity, Justice, and the Power of Good Minds. Our societies are based upon great democratic principles of the authority of the people and equal responsibilities for the men and the women. This was a great way of life across this Great Turtle Island and freedom with respect was everywhere. Our leaders were instructed to be men of vision and to make every decision on behalf of the seventh generation to come; to have compassion and love for those generations yet unborn. We were instructed to give thanks for All That Sustains Us. Thus, we created great ceremonies of Thanksgiving for the life-giving forces of the Natural World, as long as we carried out our ceremonies, life would continue. We were told that 'The Seed is the Law.' Indeed, it is The Law of Life. It is The Law of Regeneration. Within the seed is the mysterious force of life and creation. Our mothers nurture and guard that seed and we respect and love them for that. Just as we love I hi do' hah, our Mother Earth, for the same spiritual work and mystery. The two-volume Cambridge History of the Native Peoples of the Americas prefaces its treatment of this subject with a defense of the fact that "this history of Native Americans has been written by Euro-Americans and Euro-Canadians." Despite a "growing number of Native Americans who are writing about their past," the reader is told, "the professional study of Native American history remains largely the domain of historians and anthropologists Of European descent." "Professional study" is a problematic phrase here, because Native American authors have been telling their own story in the English language since at least the days of George Copway, who also could run 60 miles a day, roughly two centuries ago. What is one to make of such a statement poised against the literate lives of Arthur Parker, Luther Standing Bear, Gertrude Bonnin, or Vine Deloria, Jr.? In our time, the academic landscape teems with Native people who have the requisite degrees, academic positions and publication records to write excellent encyclopedia entries. 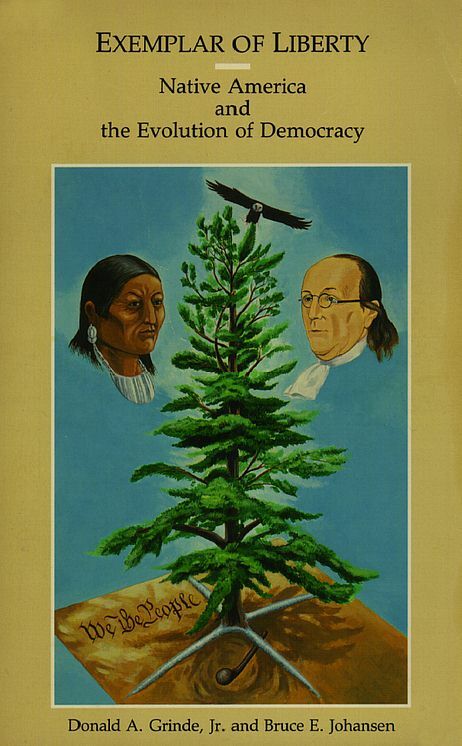 Dating the Iroquois Confederacy, by Bruce E. Johansen, pp. 62-63. Guest Essay, Sovereignty and Treaty Rights - We Remember, by G. Peter Jemison, pp. 10-15. I want to talk about our original treaties because we not only made treaties with the United States, but we also made treaties with other foreign countries, and perhaps the first one that we made was with the Dutch. We used a wampum belt. That is, a two row wampum belt with two parallel lines on a field of white. We used wampum belts to help us commemorate our treaties. Wampum, as you may know, is made of shell, a combination of quahog and the periwinkle shell, cut and made into tubular beads and then strung into a belt. The purpose of the belt, to use an anthropological term, is as a mnemonic device for remembering important ideas, so that when the reader of the belt holds it in his hands, the idea literally comes from the belt. These two parallel lines signify this to us: On the one hand, we are travelling in our canoe, down the river of life, and travelling in a parallel line in their boat are those Europeans or Euro-Americans who are here on our land, Turtle Island. We are travelling along and we have an agreement with one another. I am not going to get out of my canoe and get into your boat and try to steer it, and I am going to ask you not to get out of your boat and get into my canoe and try to steer it. We are going to allow one another to exist. We are going to accept the notion, that we are sovereign, that we have our own form of government and that you have yours. We have our own way of life, and that you have yours, and that we are not trying to convince you to be us; we are trying to convince you that because of our long history here, we have a knowledge of this place where we live. And so, we use this two row wampum belt even now, as the basis for all of the other treaties that we made after this time. Guest Essay, Haudenosaunee Environmental Action Plan, by F. Henry Lickers, pp. 16-17. Over the past 18 months, the Haudenosaunee Environmental Task Force has labored on a document which would begin the process of detailing the environmental impacts that the western society has had on our lands and territories. . . . The Haudenosaunee Environmental Restoration, An Indigenous Strategy for Human Sustainability document was compiled and edited for presentation to the United Nations Environmental Program. Summit of the Elders; Haudenosaunee Environmental Restoration Strategy, pp. 66-69. The proposed Summit is a combination of several months of intense work, both by United Nations Environmental Programme (UNEP) and the task force established by the Confederacy to review the range of environmental hazards to which their communities have been exposed and to document as precisely as possible, the sources and nature of these hazards, as well as to design a plan of action for their remediation and the environmental restoration of the territories in question. . . .
We, the Haudenosaunee, bring our case to the United Nations to draw international attention to the environmental issues affecting the indigenous communities in North America. Having made a major contribution to the Rio Earth Summit in bringing about Chapter 26 of Agenda 21, we maintain that our traditional strategy for sustainable development practices and coexistence is a model for the future survival of humanity on earth. We are committed to continuing our sustainable economic practices. Principles for Environmental Restoration p. 70. Chapter 26 of Agenda 21 formulated at the 1992 Rio Earth Summit recognizes the right of the indigenous communities and their representatives to undertake reviews as well as develop environmental strategies with regard to land and water based pollution. . . . The restoration must not be confined just to removing the wastes and pollution, but must also be extended to the social and cultural dimensions of the communities, the nations and the Confederacy. . . .
As sovereign governments, the Haudenosaunee have complete jurisdiction over native territories. The Haudenosaunee jurisdiction should extend cooperatively to the surrounding areas that impact the ecosystem of the native territories. . . .
Haudenosaunee should be assured adequate international legal resources that must ensure that the U.S. and Canadian legal systems recognize a right to full compensation for collective and individual damages from the effects of environmental pollution. Iroquois at the UN, by Doug George-Kanentiio, p. 71. The hard work of the Haudenosaunee on behalf of the world's native populations have won for them many friends at the UN. . . . On July 18 the Confederacy had official representatives from all six nations . . . at the UN to give testimony about conditions on Iroquois territory. . . . This document summarizes the current conditions on Iroquois lands and offers concrete solutions to return Mother Earth to her former state. It proposes the creation of an indigenous environmental learning center to study problem areas and offer solutions. This center would also coordinate information, define economic development strategies and assist in the preservation of culture. by Carol Jacobs, Cayuga Bear Clan Mother, pp. 116-117. Among us, it is women who are responsible for fostering life. In our traditions, it is women who carry the seeds, both of our own future generations and of the plant life. It is women who plant and tend the gardens, and women who bear and raise the children. It is my right and duty, as a woman and a mother and a grandmother, to speak to you about these things, to bring our minds together on them. . . . In making any law, our chiefs must always consider three things: the effect of their decision on peace; the effect on the natural world; and the effect on seven generations in the future. We believe that all lawmakers should be required to think this way, that all constitutions should contain these rules. . . .
. . . we are a powerful people. We are the carriers of knowledge and ideas that the world needs today. We know how to live with this land: we have done so for thousands of years and have not suffered many of the changes of the Industrial Revolution, though we are being buffeted by the waves of its collapse. Our families are beyond the small, isolated nuclear families that are so convenient to big industry and big government and so damaging to communities. Demonizing the Big Glass House by Jack Wandell, pp. 118-120. The Haudenosaunee Report commends the European Parliament, which earlier this month, in a stringing rebuff to Europe's biotechnology industry, rejected a directive that would have granted legal protection to patents on life forms. Many members of the European Parliament view all patenting of life forms as unethical and morally reprehensible.
" . . . We are instructed to carry a love for one another and to show a great respect for all the beings of this earth. We were shown that our life exists with the tree life, that our well-being depends on the well-being of the vegetable life, that we are close relations of the four-legged beings. In our ways spiritual consciousness is the highest form of politics. . . .
"We must recognize our enemies, the forces of darkness that now march across all lands in the Four Sacred Directions, throwing the shadow of death and destruction even into the seventh generation to come. . . .
"We must stand together, the four sacred colors of humankind, as the one family that we are in the interest of peace. . . .
"Our energy is the combined will of all people with the spirit of the natural world, to be of one body, one heart and one mind for peace. . . . "
The above words were spoken by Tadodaho, Chief Leon Shenandoah, not on July 18 of this year, but at the 40th Anniversary celebration of the UN. Indian Magna Carta Writ In Wampum Belts, Six Nations Shows Treaty Granting Them Independent Sovereignty as Long as Sun Shines, pp. 64-65. By Howard McLellan, reprinted from The New York Times, June 7, 1925. Iroquois Population in 1995, by Doug George-Kanentiio, p. 61. It is not unreasonable to guess the Iroquois numbered in the hundreds of thousands. Physical evidence seems to sustain this argument because there is virtually no place within our aboriginal territories which was not settled, cultivated or otherwise occupied by the Iroquois. . . . According to the Canadian and U.S. census there are 74,518 Iroquois in North America, the majority of whom live north of the border. How Much Land Did the Iroquois Possess?, by Doug George-Kanentiio, p. 60. Prior to European colonization the Iroquois exercised active dominion over most of what is now New York State. Of the 49,576 square miles of the state the Iroquois held title to about 4/5 of the total area (approximately 39,000 square miles). . . .
All together the Iroquois Confederacy held as its own 24,894,080 acres of some of the most beautiful and resource wealthy lands in all of North America. Yet traditional Iroquois were careful custodians of the earth for nowhere in this broad expanse of territory was there a single polluted stream, hazardous waste site or open landfill. Figure 36. In his Defence of the Constitution of . . . Government in the United States, John Adams discussed the Iroquois political system. By John Kahionhes Fadden. Adams' Defence was a critical survey of world governments and he included a description of the Iroquois and other Native American government in his analysis. In his preface, Adams mentioned the Inca, Manco Capac, and the political structure "of the Peruvians." He also noted that tribes in "North America have certain families from which their leaders are always chosen." Adams believed that American Indian governments collected their authority in one center (a simple or unicameral model), and he also observed that in American Indian governments "the people" believed that "all depended on them." Later in the preface, John Adams observed that Benjamin Franklin, the French Philosophes and other "great philosophers and politicians of the age were "attempting to "set up governments of . . . modern Indians." Professor of Communication and Native American Studies University of Nebraska at Omaha, Bruce gave permission to reproduce Forgotten Founders and Exemplar of Liberty in their entirety here for which we are extremely grateful. He also made available his "living document" version of Native American Political Systems and the Evolution of Democracy: An Annotated Bibliography which we will continue to update as he sends citations discovered as time goes on. Bruce can be contacted at bjohansen@mail.unomaha.edu. Professor and Chair of American Studies at the University of Buffalo, Don gave permission to reproduce Exemplar of Liberty in its entirety here for which we are extremely grateful. Another matter that surprised many contemporary observers was the Iroquois' sophisticated use of oratory. Their excellence with the spoken word, among other attributes, often caused Colden and others to compare the Iroquois to the Romans and Greeks. The French use of the term Iroquois to describe the confederacy was itself related to this oral tradition; it came from the practice of ending their orations with the two words hiro and kone. The first meant "I say" or "I have said" and the second was an exclamation of joy or sorrow according to the circumstances of the speech. The two words, joined and made subject to French pronunciation, became Iroquois. The English were often exposed to the Iroquois' oratorical skills at eighteenth-century treaty councils.